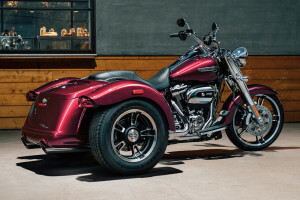 The Harley-Davidson® Trike model lineup is perfect for any rider that appreciates the confidence and capacity offered by three wheels. 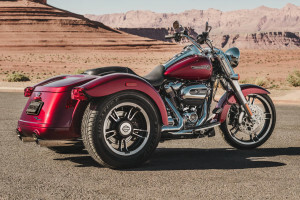 The Freewheeler® delivers the stripped down styling and feel that you love about Harley-Davidson® models, with all the features you need for even the longest rides from Lakewood, CO. Find it here at Avalanche Harley-Davidson®. The Freewheeler® delivers authentic, classic Harley-Davidson® style in a three-wheeled package. 7-Piece Chrome Nacelle: This clean lighting surround provides a sleek, integrated look with a seamless connection point for the detachable windshield. 12-inch Mini Apehanger Bars: These bars offer the highest rise available on a stock bike, and they put you in a commanding, comfortable, and upright position on the Freewheeler®. Rear Body Structure: The rear of the Freewheel® is short and tight for easy handling and maneuvering in and out of narrow spots. 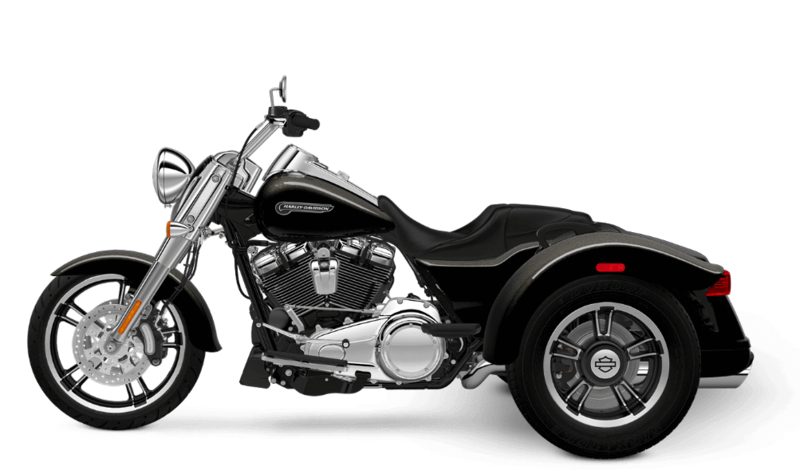 Chrome Slash Mufflers: These mufflers deliver bold style and that big exhaust note that you love from Harley-Davidson® motorcycles. 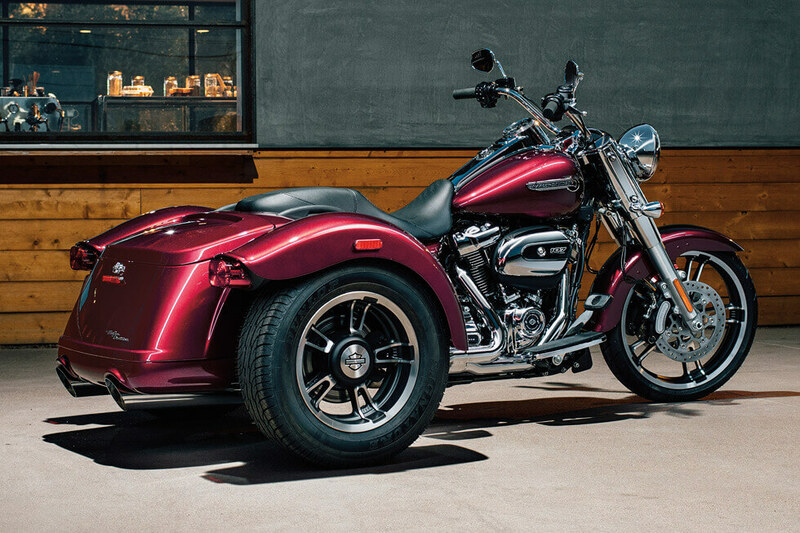 Seamless Styling and Matching Paint: The classic metal fenders and fuel tank are all paint matched for a seamless custom style. Black Powder Coated Engine with Chrome Covers: The jewel at the center of the Freewheeler® motorcycle is a black powder coated Milwaukee Eight 107™, complete with chrome covers, machined cooling fins, and custom badging. 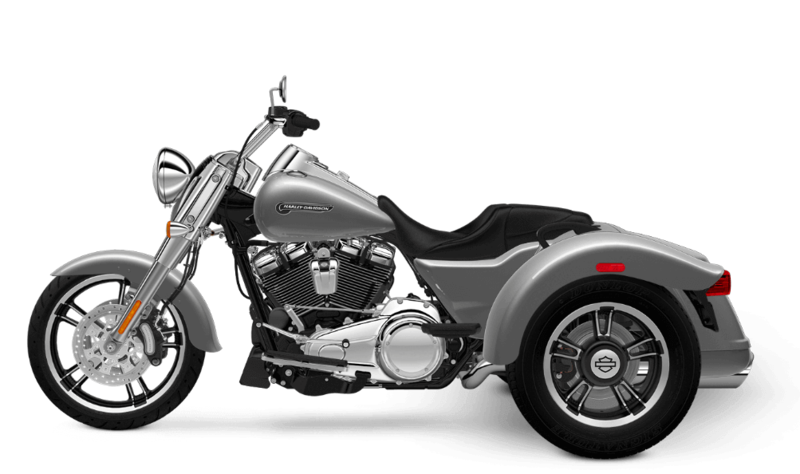 Tank and Fender Badges: The brilliant, chrome stylized Harley-Davidson® signature stands out on the tank and fender badges. Bullet Turn Signals: These classic lighting units provide a bit of chrome flair on the back end of the bike, and they deliver the visibility you want when you’re turning. High Flow Airbox: This big airbox pushes air into the engine and looks good doing it with a big slab of chrome and stylish badging. Enforcer Cast Aluminum Wheels: The big Enforcer front wheels deliver style and a confident, lightweight platform for your adventures. Three wheels and plenty of the latest features give you a bike that’s a blast to ride. All-New Milwaukee-Eight™ 107 Engine: It’s a whole new ride with an advanced Milwaukee-Eight™ 107 engine that delivers a smoother ride, stronger acceleration, and more durability. This engine is brand new, and it’s the most advanced V-Twin ever manufactured by Harley-Davidson®. Milwaukee-Eight™ 107 Overview: This new engine adds displacement and a higher compression ratio to boost power output and improve acceleration. Refined fit, cooler running temperature, and reduced vibration all help improve ride quality. A richer exhaust note is possible thanks to reduced mechanical noise. Even charging is improved to meet the needs of riders who often have many devices to keep powered up. Steering Head and Front Forks: With 49mm fork legs, the Freewheeler® delivers confident handling and plenty of control when you dive into the kind of sharp turns you’ll find on the streets of Aurora. Available H-D® Smart Security System: Choose to upgrade to this factory installed option and get the peace of mind that comes with knowing your bike is protected. Three Wheel Frame Design: With a three-wheeled motorcycle, you want added stability without sacrificing the famous riding dynamics, and that’s what the Freewheeler® delivers. Six-Speed Cruise Drive® Transmission: The Six-Speed Cruise Drive® transmission gives you total control over the big V-Twin engine. Ergonomically Designed Hand Controls: Your hand controls are maybe the most important part of the ride, and these are designed to fit you best and keep you comfortably in control for the long haul. Linked Rear to Front Brakes: In order to give you the stopping power you need, we’ve linked the brakes from rear to front. When you apply the rear brakes, the front brakes engage as well. Dual Disc Front and Rear Brakes: With dual discs in both the front and rear, you’ve got the braking power to rein things in quick on those curving mountain roads. Electric Reverse with Handlebar Mounted Control: Electric reverse gives you the ability to back out of tight spots quickly and easily. That’s something you’ll definitely appreciate if you’ve ever ridden a trike before. Dunlop Tires: Multiple compounds mean that these tires deliver both the performance and the long lasting durability you want. 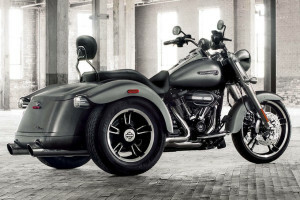 The Freewheeler® delivers the same iconic feel as the rest of the Harley-Davidson® touring lineup, but on three wheels. Full-Length Floor Boards: Find the perfect riding position for you with these full length foot boards. They even offer rubber isolation to dampen road vibrations. One Touch Design: Every compartment cover and trunk lid opens with the single touch of a button, even while wearing gloves. Battery Charging Harness: Every touring bike should have a battery charging harness, and that’s why it’s standard on the Freewheeler®. Air Adjustable Rear Shocks: You’ve got suspension to smooth out the bumps, and it’s easy to adjust it based on the payload you’re carrying. Cruise Control: Cruise control makes it easy to eat up those long highway miles. Assist and Slip Clutch: The slip and assist clutch evens out shifting with less lever force, so it’s a breeze to tackle stop and go traffic. Trunk System: The trunk on the Freewheeler® model is a one-of-a-kind design that opens left to right with one hand. This gives you easy access to all your gear even while wearing gloves. Passenger Grab Rails: These smart grab rails give your rear seat passenger something sturdy to hold onto for added confidence. Parking Brake: Down by your left boot, there’s an easy parking brake that engages with a press and disengages with another. Reduced Reach Comfort Stitched Seat: With the reduced reach seat, you’re closer to the bars for a more upright posture.